How the Review System Works? Review system can be a great opportunity for you to obtain useful feedback from your users about the published ads and users who posted them. Users are allowed to express their opinion and it is also a great way to increase their trust in your classifieds website. 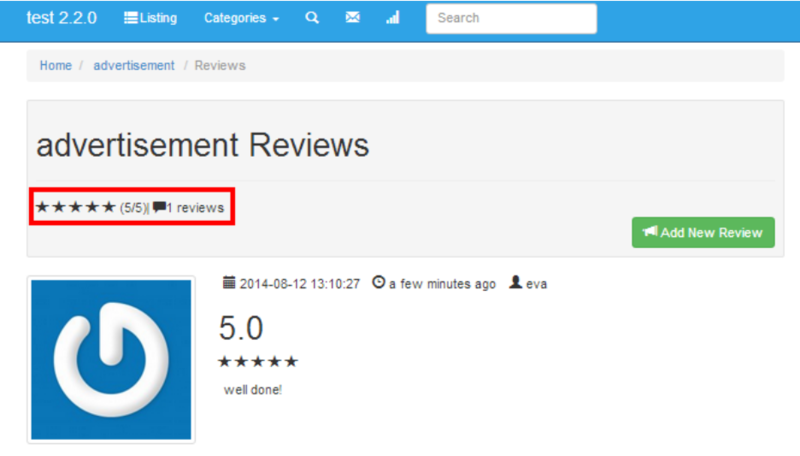 Note that the review option is available only for the Premium Users. when you’re ready to have a Premium Theme, go to our market. Then, go to your website, click on an ad and you can see that the option of leaving a review appeared as shown in the below screenshot. When the user adds any feedback, the number of written reviews and awarded stars will appear under the title of the ad. Also, the user review score will take the average score out of all the reviews he got from all of his ads. What is more, an additional option is provided for you! You are able to give an access to the review system only for the users who make a transaction. If the user doesn’t purchase the item mentioned in the ad then he wont be able to post a review to that ad. To activate this option, log in your Admin Panel, choose Settings > Advertisement > Reviews Configuration and in the field: Only for paid transactions - select ON. Save the changes and you’re ready! IMPORTANT! Make sure that the user paypal link option is activated, otherwise the reviews cannot work properly. To get this working, go to Settings > Payment > Paypal, Set “Buy Now” to “On” and Save changes.